A large snake with heavily keeled scales, a narrow head that is slightly wider than the neck, and a protruding rostral scale on the tip of the snout which is rounded sharply in the front and not raised or only slightly raised above adjacent scales. Ground color is straw, light brown or tan, with large brown or reddish blotches or saddles along the back and smaller markings on the sides. The back of the neck is yellowish or tan with small black spots. The underside is cream to yellowish with dark spots. Key to California gopher snake subspecies. Active in the daytime, and at night in hot weather, and especially at dusk and dawn. One of the most commonly seen snakes on roads and trails, especially in the spring when males are actively seeking a mate, and in the fall when hatchlings emerge. A good burrower, climber, and swimmer. A powerful constrictor; kills prey by suffocating them in body coils or by pressing the animal against the walls of their underground burrows. When threatened, a gophersnake willl elevate and inflate its body, flatten its head into a triangular shape, hiss loudly, and quickly shake its tail back and forth to make a buzzing sound which may be a mimic of a rattlesnake rattle. You can listen to a recording of a gophersnake hissing here, and watch short movies of a gopher snake hissing and striking here, and shaking its tail here. Small mammals, especially pocket gophers, birds and their eggs, and occasionally lizards and insects. Eggs are laid June - August and hatch in 2 to 2.5 months. This subspecies, Pituophis catenifer affinis - Sonoran Gopher Snake, occurs in southeast California, from the Imperial Valley north to roughly the San Bernardino County line, and east to the Colorado river. The subspecies' range extends south into the northeast tip of Baja California, and east into Arizona and New Mexico, then south through West Texas and far into Mexico. The species Pituophis catenifer - Gopher Snake, occurs from the southern edge of Canada in British Columbia, Alberta and Saskatchewan, south to the tip of Baja California and northern mainland Mexico, and east to Indiana and east Texas, excluding most of Arkansas, Minnesota, and North Dakota, and much of Illinois and Wisconsin. It is also found in the Channel Islands and on several islands off the west coast of Baja California. Found in a variety of habitats - desert flats, agricultural land, riparian areas including below sea level in the Imperial Valley. 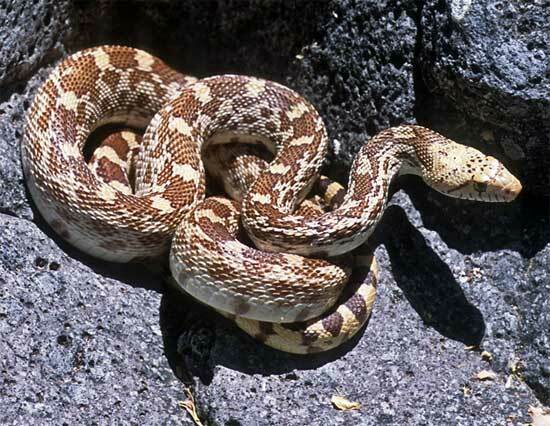 8 subspecies of Pituophis catenifer are recognized - 2 occur in Baja California, and 6 occur in the United States. 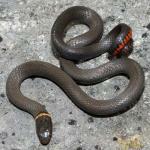 It has been proposed that the snakes from Baja California are a new species. 5 of these 8 subspecies occur in California, with one endemic, and one that only occurs in California and Baja California. Gophersnakes are related to Ratsnakes and Kingsnakes, and they have been known to interbreed with these species. Conservation Issues (Conservation Status) A very common snake, but often mistaken for the similar rattlesnake and killed unnecessarily. Frequently killed by traffic when crossing roads.